I visited San Francisco for the first time about 15 years ago. Within a few hours, I declared that I would live there someday. The closest I've come (at least by the standards of a Midwesterner) was the year that I spent living in Oregon, but I've still done my best to make it out for visits as often as possible. Many of my best friends live in the area, and it's just a really incredible city. I love the people, the vibe, the architecture, the culture, and the overall progressiveness. The food is phenomenal, the design is impeccable, the shopping is fantastic, the music scene rocks... I could go on and on. Traveling is a huge part of my life, and I've been lucky to visit a lot of cities. I am also proud to be a Chicago girl - I moved all around the country in the years following college, and still ended up back here, right where I started. 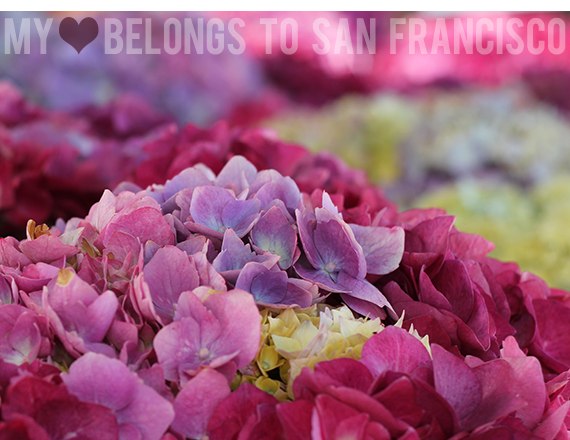 But the quick trip I got to take this weekend as part of the Adobe Photoshop Elements project I'm working on reminded me that deep down, my heart really does belong to San Francisco. I could go on and on about the trip and all the adventures we piled into two days, but I figured I'd spare you guys and just share a few pictures I took along the way. I wish I could say I'd taken more shots with my "real" camera instead of just my iPhone, but it was a very action packed 48 hours, and let's face it - whipping your phone out of your purse is infinitely more convenient than awkwardly attempting to change lenses and adjust DSLR settings. I did take some more invested shots though, and I'll absolutely be sharing them later this week. I was admittedly a little nervous heading out for this trip, but any worries I had quickly faded upon my arrival. The people at Adobe are beyond cool, and they made our Photoshop Elements training so much fun. And can I just say that the San Francisco Adobe headquarters building is freaking amazing? Seriously. I want to work in that space everyday. Talk about well-executed, chic design. Nothing about it felt corporate. It was gorgeous. I got to squeeze in a little shopping and hang time with the other bloggers, which was also such a great experience, as was the Gaultier exhibit at the DeYoung Museum. Wow. I mean it - if you live in the Bay area and can check it out, please do. It was mind blowing. I've been playing catch-up with work stuff (and sleep) yesterday and today, but am looking forward to sharing more Adobe Elements Ambassador posts over the upcoming months! I hope your weekend was especially fun (and that your Monday is as enjoyable as Mondays can be!). looks like such a great time, so happy you enjoyed your trip! Looks like you had a great trip! I've always wanted to visit San Francisco, it seems like such an amazing city! i live in sacramento and feel so grateful to be two hours away from one of the coolest cities on the planet. we're able to take several day/weekend trips there each year for concerts, festivals and exhibits. it's also a nice escape from the sactown heat. love love love SF. I know what you mean... San Francisco is just one of those places where everything seems right and wonderful and better than where you call home. I grew up about 100 miles west of Chicago and visited often growing up and still do now.. and its great.. but San Fran just has a leg up on it. Period. My sister lives in between Sacramento and San Francisco so a visit to see her means a visit to San Francisco. Your photos are lovely and I can't wait to see more. Looks like you had a lovely little trip. My mom's family lives near San Fran, so I've been there a lot and it never gets old. The next time you go and have some spare time, I recommend Incanto for an evening meal. It's not by a lot of other stuff (in the Noe Valley neighborhood, I think it was? ), but there's a train stop a few blocks away. I can't wait to hear about the rest of your trip! You know it makes the locals insane when people call it Frisco or San Fran. It how natives and transplants alike filter through the interlopers. Looks like you had an amazing time! Can't wait to see what you learned! Ugh, you make me miss San Francisco so much! It's such a beautiful city...I'm thinking I need to make a trip there by the end of this summer. I'm glad you had fun. Great pictures! It is such an amazing town. If you could see me right now, you'd see that I'm green with envy! I first went there about 25 years ago and I feel the same way as you. I always wanted to live there. I'm a Chicago girl myself. I've been there twice since. My daughter eloped to Yosemite in 2010 and invited us (immediate family) to join them. We met in San Francisco first and had the best two days ever! Both the food shots and the bridge shot are very appealing! TFS your views on SF! there's definitely a special place in my heart for san fran. hmm.. i ought to drive up this summer. that looks like such a great trip and congrats on working w/ adobe! !